Little Miss Bingo | Play on Mobile & Win on the go! Play to win big with Little Miss Bingo, a top online Cozy Games bingo site. Play and win on your desktop or enjoy Little Miss Bingo mobile games from your smartphone or tablet! They say some of the best things in life come in small packages! So roll into Little Miss Bingo's cute world of fun and prepare for plenty of entertaining chances to win big. This site is one of the best in Britain and has even received critical acclaim from Bestoffersbingo.co.uk. Little Miss will welcome you to her cute girlie pink and baby blue themed world, filled with pink cupcakes, shoes and a fabulous welcome package. The site is smooth to navigate, fast to load and offers the best in gaming entertainment. 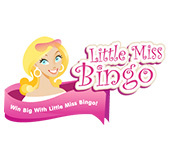 If you're looking for a sweet girlie young bingo site with lots of fun, a buzzing Little Miss Bingo Community and a whole heap of cash, then you've come to the right place with littlemissbingo.com. The best part about Little Miss Bingo is you don't even have to deposit any money when you sign up. 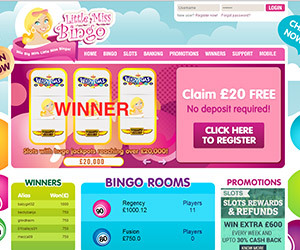 The cute blonde-haired Little Miss Bingo with greet you with a £20 FREE as soon as you register and login. With this £20 you can play all the bingo games and other side games win some cash without even spending a penny. Then when you are ready to deposit £10, will give you a 400% Bingo Bonus to play with £50, plus 90 days of Free bingo. The deposit bonuses don't stop there! For the second deposit bonus you make you will receive a 300% Bingo Bonus and for you the 3rd a 350% bonus. You'll also be treated to great offers like Session Bingo, Free Bingo, the £10,000 Mega Giveaway, Daily Raffles, Weekly Cashback and Jackpot specials. You'll also be rewarded with perks and games in the VIP club and fun chat community. 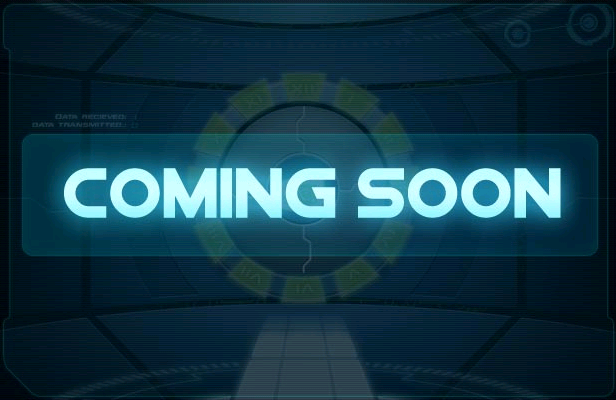 Watch this space for the latest Little Miss Bingo free coupon codes. Little Miss Bingo boasts a fun-packed collection of online bingo, slots, casino games, plus scratchcards, freebets and tourneys. You can take your pick from 30, 75, 80 and 90 Ball themed bingo game, and strike it lucky with the 90 Ball Super Jackpot room. You can then spin through a Cozy collection of slots like Treasures of Egypt and honey Bees, plus progressive jackpot games. The casino lounge offers European Blackjack, Keno, Roulette and Jacks or Better. If that's not enough entertainment, you can explore the scratchcards like Go Bananas, freebets liek Honey Bees and tourneys like Wizards of Bingo. You can also continue the sweet adventure on your mobile, iphone, ipad, ipad mini, android phones and tablets.